Divine Mercy Radio is a lay apostolate dedicated to sharing the truth and beauty, and the love and joy of the Catholic faith primarily through radio. Our mission is to strengthen Catholics in their faith, to invite fallen-away Catholics back to the faith, and to inform non-Catholics of the gospel of Jesus through programming which proclaims His message of truth, mercy, and love. We were established as a 501c3 non-profit organization in 2008. Our goal has always been to purchase a large radio station, but in the Raleigh area that is very difficult because they don't come up for sale. While pioneers in this media, we were instrumental in assisting a couple low power FM station owners to begin broadcasting Catholic radio programs during our journey and now finally have the opportunity to purchase a large AM station, 540AM, which will cover more than 4M people. You can see the large reach the station has in the map below. The purchase of WETC, 540AM, was completed on August 30, 2018 which included the FCC broadcast license, towers, broadcasting equipment and 44 acres of land. Our goal of $948,000 included the cost of the station, broker fees, legal fees, and $46K to cover the engineering time and expense to fix small issues and upgrade the station to 10,000 watts. To finalize the purchase, we found it necessary to borrow $680,000. We plan an aggressive loan payoff within 1-2 years which can only occur with all of your help. WETC, 540AM, provides for a listener-ship of 75-80% of the 97 parishes in the Raleigh Diocese. That is estimated to be 350,000 Catholics out of over 4,000,000 people. The additional listener-ship will make that happen. The Roman Catholic Diocese of Raleigh comprises the 54 eastern counties of North Carolina, covering approximately 32,000 square miles. The diocese is divided into eight deaneries with a total of 97 parishes and missions and five centers for campus ministry. The diocese is served by 113 active diocesan and religious order priests. The diocese includes 220,000 registered and an equal amount of unregistered Catholics. "After moving to Wake Forest from Long Island a few years ago, I began to sense that the Lord was calling me to apply to the seminary to discern the priesthood. However, I was afraid to heed His call. I was comfortable working as a teacher and I didn’t want my life to change. However, Jesus was persistent and would keep calling me for the next six years. 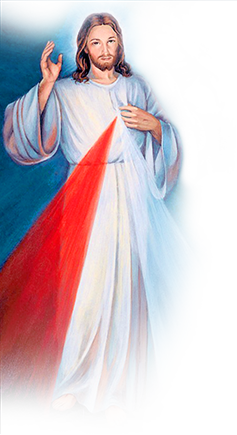 I would listen to Divine Mercy Radio every day while driving to work and I kept hearing stories about the priesthood and listeners speaking about their own vocational struggles. One day, I heard a young man discussing his decision to apply to the seminary and how happy he was that he did. I knew that I couldn’t run from Jesus any longer. I stopped, looked around, and realized that Jesus had never given up on me and that He loves me so much. As a seminarian for the Diocese of Raleigh, I am truly grateful for Divine Mercy Radio for giving me the courage to apply to the seminary. May our Lord bless Divine Mercy Radio and may Our Blessed Mother watch over all who listen to this remarkable radio station!" Imagine the impact of a station that will reach 100 times more people. We have been very blessed with this opportunity and hope you will join us in keeping Catholic Radio in NC a reality. God Bless you! !